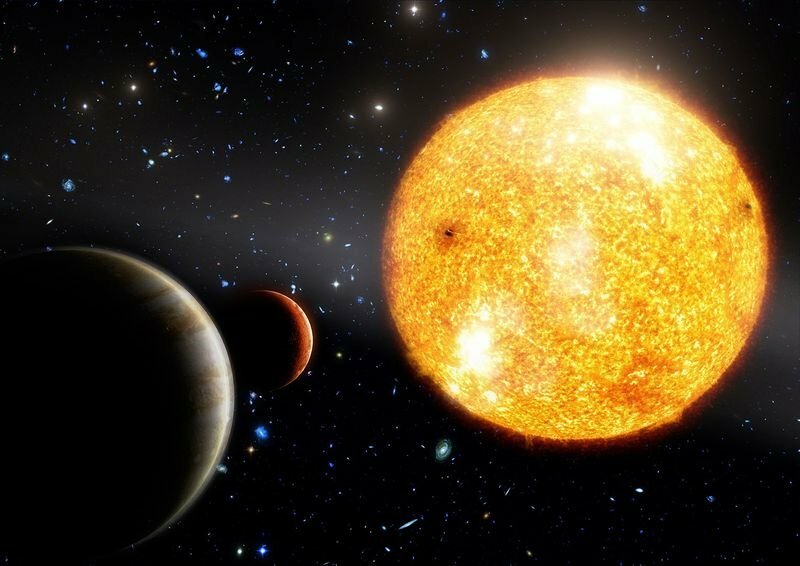 A glimpse into alien worlds: Artist’s impression of HIP 11952 and its two Jupiter-like planets. At the UK-Germany National Astronomy Meeting NAM2012, the Baryon Oscillation Spectroscopic Survey (BOSS) team announced the most accurate measurement yet of the distribution of galaxies between five and six billion years ago. A map of the galaxies in a thin slice of the BOSS catalogue. We are at the centre of the arc, outside the bottom part of the figure, and each black point is a galaxy. The red circle shows the approximate size of the BAO feature. This was the key 'pivot' moment at which the expansion of the universe stopped slowing down due to gravity and started to accelerate instead, due to a mysterious force dubbed “dark energy”. The nature of this “dark energy” is one of the big mysteries in cosmology today, and scientists need precise measurements of the expansion history of the universe to unravel this mystery – BOSS provides this kind of data. In a set of six joint papers presented, the BOSS team, an international group of scientists with the participation of the Max Planck Institute of Extraterrestrial Physics in Garching, Germany, used these data together with previous measurements to place tight constraints on various cosmological models. The BOSS survey, which is a part of the Sloan Digital Sky Survey (SDSS-III), was started in 2009 to probe the universe at a time when dark energy started to dominate. The survey will continue until 2014, collecting data for 1.35 million galaxies with a custom-designed new spectrograph on the 2.5-metre Sloan Telescope at the Apache Point Observatory in New Mexico, USA. In the first year-and-a-half, it has already mapped the three-dimensional positions of more than a quarter of a million galaxies spread across about one tenth of the sky, yielding the most accurate and complete map of the galaxy distribution up to a distance of about 6 billion light years. Galaxies form a “cosmic web” with a variety of structures which encode valuable information about our universe. One particular feature, the so-called “Baryonic Acoustic Oscillations” (BAO), has been subject of much interest from scientists as it provides them with a “standard rod”. BAO are a relic of the early phases of the universe, when it was a hot and dense “soup” of particles. Small variations of density travelled through this “soup” as pressure-driven (sound) waves. As the universe expanded and cooled, the pressure dropped, causing these waves to stall after they had traveled about 500 million light years. These frozen waves imprinted a particular signature on the matter distribution and are visible in the galaxy map today: it is in fact slightly more probable to find pairs of galaxies separated by this scale than at smaller or larger distances. Measurements of the apparent size of the BAO scale in the galaxy distribution then provide information about cosmic distances. Combined with the measurement of the galaxies’ redshift – a measure for how fast they move away as a result of the cosmic expansion – scientists can then reconstruct the expansion history of the universe. The record of baryon acoustic oscillations (white rings) in galaxy maps helps astronomers retrace the history of the expanding universe. These schematic images show the universe at three different times. The false-colour image on the right shows the "cosmic microwave background," a record of what the very young universe looked like, 13.7 billion years ago. The small density variations present then have grown into the clusters, walls, and filaments of galaxies that we see today. These variations included the signal of the original baryon acoustic oscillations (white ring, right). As the universe has expanded (middle and left), evidence of the baryon oscillations has remained, visible in a "peak separation" between galaxies (the larger white rings). The SDSS-III results announced today (middle) are for galaxies 5.5 billion light-years distant, at the time when dark energy turned on. Comparing them with previous results from galaxies 3.8 billion light-years away (left) measures how the universe has expanded with time. Credit: E. M. Huff, the SDSS-III team, and the South Pole Telescope team. Graphic by Zosia Rostomian. The new BOSS data, combined with previous analyses, can now constrain the parameters of the standard cosmological model to an accuracy of better than five per cent. "All the different lines of evidence point to the same explanation," says Dr. Ariel Sanchez, scientist at the Max Planck Institute for Extraterrestrial Physics and lead author of one of the six papers released today. "The dark energy is consistent with Einstein's cosmological constant: a small but irreducible energy continually stretching space itself, driving the accelerated expansion of the universe." Neutrinos are tiny, subatomic particles. Even though a number of experiments have shown that they must have mass, scientists do not know how much they actually weigh, as it is difficult to measure this in a laboratory. However, as an additional component in the hot, early phase of the universe the neutrinos affect the growth of structures. The galaxy distribution probed by BOSS provides information about the maximum mass that these neutrinos are allowed to have. “This is really the connection of two extreme worlds, the very large and the very small”, adds Ariel Sanchez. The quality of the new data even provided the BOSS team with new clues about cosmic inflation, a period of time shortly after the Big Bang during which the universe expanded at an incredible rate. During cosmic inflation, small regions of space were blown out to form our entire observable universe. At the same time, tiny quantum fluctuations also expanded and became the seeds of the structures that the BOSS data show us today. "There is a real zoo of alternative models of inflation. With BOSS we get important new clues about the inflationary phase of the universe, which allows us to pare down the market of available models", remarks Ariel Sanchez. Ariel G. Sánchez et al. Ashley J. Ross et al. Two small-scale versions of three-dimensional photovoltaic arrays were among those tested by Jeffrey Grossman and his team on an MIT rooftop to measure their actual electrical output throughout the day. The use of stars, planets and stellar constellations for navigation was of fundamental importance for mankind for thousands of years. Now a group of scientists at the Max-Planck Institute for Extraterrestrial Physics in Garching, Germany have developed a new technique using a special population of stars to navigate not on Earth, but in voyages across the universe. Team member Prof. Werner Becker presented their work at the National Astronomy Meeting in Manchester on Friday 30 March. Artist’s impression of pulsar-based navigation in deep space. The characteristic time signatures of strongly magnetised and fast spinning neutron stars, called pulsars, are used as natural navigation beacons to determine the position and velocity of a spacecraft. Have you ever asked yourself how the starship Enterprise in the TV series Star Trek found its way through the depths of space? Cosmic lighthouses called pulsars might be the key to this interstellar navigation - not only in science fiction but also in the near future of space flight. When stars much more massive than our Sun reach the end of their lives, their final demise is marked by a dramatic supernova explosion that destroys most of the star. But many leave behind compact, incredibly dense remnants known as neutron stars. Those detected have strong magnetic fields that focus emission into two highly directional beams. The neutron star rotates rapidly and if the beam points in the direction of the Earth we see a pulse of radiation at extremely regular intervals – hence the name pulsar. Prof. Becker and his team are developing a novel navigation technology for spacecraft based on the regular emission of X-ray light from pulsars. Their periodic signals have timing stabilities comparable to atomic clocks and provide characteristic time signatures that can be used as natural navigation beacons, similar to the use of GPS satellites for navigation on Earth. By comparing the arrival times of the pulses measured on board the navigator spacecraft with those predicted at a reference location, the spacecraft position can be determined with an accuracy of few kilometres, everywhere in the solar system and far beyond. At the moment even the fastest spacecraft would take thousands of years to travel to the nearest star and far longer to explore the wider Galaxy so we are unlikely to see journeys like this happen for many centuries. Nonetheless, the pulsar-based navigation system could be in use in the near future. Recent research shows that the space age has coincided with a period of unusually high solar activity, called a grand maximum. Isotopes in ice sheets and tree rings tell us that this grand solar maximum is one of 24 during the last 9300 years and suggest the high levels of solar magnetic field seen over the space age will reduce in future. This decline will cause a reduction in sunspot numbers and explosive solar events, but those events that do take place could be more damaging. Graduate student Luke Barnard of the University of Reading presented the new results on ‘solar climate change’ in his paper at the National Astronomy Meeting in Manchester. Image of a coronal mass ejection (CME) on June 7, 2011, recorded in ultraviolet light by the Solar Dynamics Observatory (SDO) satellite. The shock front that forms ahead of these huge expulsions of material from the solar atmosphere (the event shown moved at 1400 km/s) can generate large fluxes of highly energetic particles at Earth which can be a considerable hazard to space-based electronic systems and with repeated exposure, a health risk for crew on board high-altitude aircraft. The main sources of radiation are galactic cosmic rays (GCRs), which are a continuous flow of highly energetic particles from outside our solar system and solar energetic particles (SEPs), which are accelerated to high energies in short bursts by explosive events on the sun. The amount of radiation in the near-Earth environment from these two sources is partly controlled in a complicated way by the strength of the Sun's magnetic field. There are theoretical predictions supported by observational evidence that a decline in the average strength of the Sun's magnetic field would lead to an increase in the amount of GCRs reaching near-Earth space. Furthermore there are predictions that, although a decline in solar activity would mean less frequent bursts of SEPs, the bursts that do occur would be larger and more harmful. Currently spacecraft and aircraft are only designed and operated to offer suitable protection from the levels of radiation that have been observed over the course of the space age. A decline in solar activity would result in increased amounts of radiation in near-Earth space and therefore increased risk of harm to spacecraft and aircraft and the astronauts and aircraft crews that operate them. By comparing this grand maximum with 24 previous examples, Mr Barnard predicts that there is an 8% chance that solar activity will fall to the very low levels seen in the so-called ‘Maunder minimum’, a period during the seventeenth century when very few sunspots were seen. In this instance, the flux of GCRs would probably increase by a factor of 2.5 from present day values and the probability of observing a large SEP event will fall from the presently seen 5 down to 2 events per century. However, the more probable scenario is that solar activity will decline to approximately half its current value in the next 40 years, in which case the flux of GCRs will increase by a factor of 1.5 and the probability of large SEP events to increase from the current value to 8 events per century. As a result the near-Earth space radiation environment will probably become more hazardous in the next 40 years. Using the IRAM array of millimetre-wave telescopes in the French Alps, a team of European astronomers from Germany, the UK and France have discovered a large reservoir of gas and dust in a galaxy that surrounds the most distant supermassive black hole known. Light from the galaxy, called J1120+0641, has taken so long to reach us that the galaxy is seen as it was only 740 million years after the Big Bang, when the universe was only 1/18th of its current age. Team leader Dr. Bram Venemans of the Max-Planck Institute for Astronomy in Heidelberg, Germany presented the new discovery on Wednesday 28 March at the National Astronomy Meeting in Manchester. This image shows the bright emission from carbon and dust in a galaxy surrounding the most distant supermassive black hole known. At a distance corresponding to 740 Million years after the Big Bang, the Carbon line, which is emitted by the galaxy at infrared wavelengths (that are unobservable from the ground), is redshifted, because of the expansion of the Universe, to millimeter wavelengths where it can be observed using facilities such as the IRAM Plateau de Bure Interferometer. The Institut de Radioastronomie Millimetrique (IRAM) array is made up of six 15-m size telescopes that detect emission at millimetre wavelengths (about ten thousand times as long as visible light) sited on the 2550-m high Plateau de Bure in the French Alps. The IRAM telescopes work together to simulate a single much larger telescope in a so-called interferometer that can study objects in fine detail. A recent upgrade to IRAM allowed the scientists to detect the newly discovered gas and dust that includes significant quantities of carbon. This is quite unexpected, as the chemical element carbon is created via nuclear fusion of helium in the centres of massive stars and ejected into the galaxy when these stars end their lives in dramatic supernova explosions. This image of J1120+0641 (red dot in the center) was created by combining survey data in visual and infrared light of the Sloan Digital Sky Survey and the UKIRT Infrared Deep Sky Survey. From the emission from the dust, Venemans and his team are able to show that the galaxy is still forming stars at a rate that is 100 times higher than in our Milky Way. They give credit to the IRAM upgrade that made the new discovery possible. "Indeed, we would not have been able to detect this emission only a couple years ago." says team member Dr Pierre Cox, director of IRAM. The astronomers are excited about the fact that this source is also visible from the southern hemisphere where the Atacama Large Millimeter/submillimeter Array (ALMA), which will be the world's most advanced sub-millimetre / millimetre telescope array, is currently under construction in Chile. Observations with ALMA will enable a detailed study of the structure of this galaxy, including the way the gas and dust moves within it. Dr Richard McMahon, a member of the team from the University of Cambridge in the UK is looking forward to when ALMA is fully operational later this year. “The current observations only provide a glimpse of what ALMA will be capable of when we use it to study the formation of the first generation of galaxies." This detail from a DSI scan shows a fabric-like 3-D grid structure of connections in monkey brain. "Far from being just a tangle of wires, the brain's connections turn out to be more like ribbon cables -- folding 2D sheets of parallel neuronal fibers that cross paths at right angles, like the warp and weft of a fabric," explained Van Wedeen, M.D., of Massachusetts General Hospital (MGH), A.A. Martinos Center for Biomedical Imaging and the Harvard Medical School. "This grid structure is continuous and consistent at all scales and across humans and other primate species." Wedeen and colleagues report new evidence of the brain's elegant simplicity March 30, 2012 in the journal Science. The study was funded, in part, by the NIH's National Institute of Mental Health (NIMH), the Human Connectome Project of the NIH Blueprint for Neuroscience Research, and other NIH components. "Getting a high resolution wiring diagram of our brains is a landmark in human neuroanatomy," said NIMH Director Thomas R. Insel, M.D. "This new technology may reveal individual differences in brain connections that could aid diagnosis and treatment of brain disorders." Knowledge gained from the study helped shape design specifications for the most powerful brain scanner of its kind, which was installed at MGH's Martinos Center last fall. The new Connectom diffusion magnetic resonance imaging (MRI) scanner can visualize the networks of crisscrossing fibers – by which different parts of the brain communicate with each other – in 10-fold higher detail than conventional scanners, said Wedeen. "This one-of-a-kind instrument is bringing into sharper focus an astonishingly simple architecture that makes sense in light of how the brain grows," he explained. "The wiring of the mature brain appears to mirror three primal pathways established in embryonic development." As the brain gets wired up in early development, its connections form along perpendicular pathways, running horizontally, vertically and transversely. This grid structure appears to guide connectivity like lane markers on a highway, which would limit options for growing nerve fibers to change direction during development. If they can turn in just four directions: left, right, up or down, this may enforce a more efficient, orderly way for the fibers to find their proper connections – and for the structure to adapt through evolution, suggest the researchers. Obtaining detailed images of these pathways in human brain has long eluded researchers, in part, because the human cortex, or outer mantle, develops many folds, nooks and crannies that obscure the structure of its connections. Although studies using chemical tracers in neural tracts of animal brains yielded hints of a grid structure, such invasive techniques could not be used in humans. Wedeen's team is part of a Human Connectome Project Harvard/MGH-UCLA consortium that is optimizing MRI technology to more accurately to image the pathways. In diffusion imaging, the scanner detects movement of water inside the fibers to reveal their locations. A high resolution technique called diffusion spectrum imaging (DSI) makes it possible to see the different orientations of multiple fibers that cross at a single location – the key to seeing the grid structure. In the current study, researchers performed DSI scans on postmortem brains of four types of monkeys – rhesus, owl, marmoset and galago – and in living humans. They saw the same 2D sheet structure containing parallel fibers crossing paths everywhere in all of the brains – even in local path neighborhoods. The grid structure of cortex pathways was continuous with those of lower brain structures, including memory and emotion centers. The more complex human and rhesus brains showed more differentiation between pathways than simpler species. Among immediate implications, the findings suggest a simplifying framework for understanding the brain's structure, pathways and connectivity. The technology used in the current study was able to see only about 25 percent of the grid structure in human brain. It was only apparent in large central circuitry, not in outlying areas where the folding obscures it. But lessons learned were incorporated into the design of the newly installed Connectom scanner, which can see 75 percent of it, according to Wedeen. Much as a telescope with a larger mirror or lens provides a clearer image, the new scanner markedly boosts resolving power by magnifying magnetic fields with magnetically stronger copper coils, called gradients. Gradients make it possible to vary the magnetic field and get a precise fix on locations in the brain. The Connectom scanner's gradients are seven times stronger than those of conventional scanners. Scans that would have previously taken hours – and, thus would have been impractical with living human subjects – can now be performed in minutes. "Before, we had just driving directions. Now, we have a map showing how all the highways and byways are interconnected," said Wedeen. "Brain wiring is not like the wiring in your basement, where it just needs to connect the right endpoints. Rather, the grid is the language of the brain and wiring and re-wiring work by modifying it." Reference: Wedeen VJ, Rosene DL, Ruopeng W, Guangping D, Mortazavi F, Hagmann P, Kass JH, Tseng W-YI. The Geometric Structure of the Brain Fiber Pathways: A Continuous Orthogonal Grid. March 30, 2012 Science. 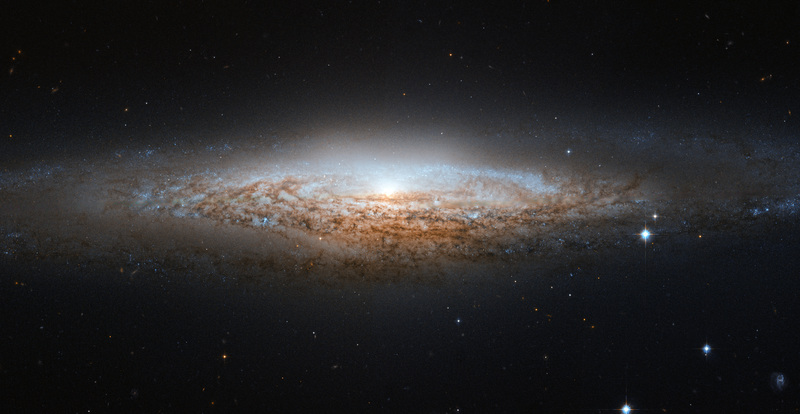 NGC 2683, discovered on Feb. 5, 1788, by the famous astronomer William Herschel, lies in the Northern constellation of Lynx. A constellation named not because of its resemblance to the feline animal, but because it is fairly faint, requiring the "sensitive eyes of a cat" to discern it. And when you manage to get a look at it, you’ll find treasures like this, making it well worth the effort. Unless development patterns change, by 2030 humanity’s urban footprint will occupy an additional 1.5 million square kilometres - comparable to the combined territories of France, Germany and Spain, say experts at a major international science meeting underway in London. UN estimates show human population growing from 7 billion today to 9 billion by 2050, translating into some 1 million more people expected on average each week for the next 38 years, with most of that increase anticipated in urban centres. And ongoing migration from rural to urban living could see world cities receive yet an-other 1 billion additional people. Total forecast urban population in 2050: 6.3 billion (up from 3.5 billion today). The question isn’t whether to urbanize but how, says Dr. Michail Fragkias of Arizona State University, one of nearly 3000 participants at the conference, entitled “Planet Under Pressure”. Unfortunately, he adds, today’s ongoing pattern of urban sprawl puts humanity at severe risk due to environmental problems. Dense cities designed for efficiency offer one of the most promising paths to sustainability, and urbaniza-tion specialists will share a wealth of knowledge available to drive solutions. How best to urbanize is one among many “options and opportunities” under discus-sion by global environmental change specialists today, Day 2 of the four-day confer-ence March 26-29, convened to help address a wide range of global sustainability challenges and offer recommendations to June’s UN “Rio+20” Earth Summit. Other leading options and opportunities being addressed include green economic development (Yvo de Boer, former Executive Secretary, UN Framework Convention on Climate Change), securing food and water for the world's poorest (Bina Agarwal, Director, Institute of Economic Growth, Delhi University, India), and planetary stew-ardship: risks, obstacles and opportunities (Georgina Mace, Professor, Imperial Col-lege, London). For a full list of “options and opportunities” conference sessions and topics, see conference website. Shobhakar Dhakal, Executive Director of the Tokyo-based Global Carbon Project, says reforms in existing cities and better planning of new ones offer disproportionately large environmental benefits compared with other options. Over 70% of CO2 emissions today relate to city needs. In billions of metric tonnes, urban-area CO2 emissions were estimated at about 15 in 1990 and 25 in 2010, with forecasts of growth to 36.5 by 2030, assuming business as usual. Addressing climate change therefore demands focusing on urban efficiencies, like using weather conditions and time of day-adjusted toll systems to reduce traffic congestion, for example: Congestion worldwide costs economies an estimated 1 to 3% of GDP – a problem that not only wastes fuel and causes pollution, but time – an estimated 4.2 billion hours in the USA alone in 2005. Estimated cost of New York City’s congestion: US$4 billion a year in lost productivity. An “Internet of things” is forming, he notes – a fast-growing number of high-tech, artificially intelligent, Internet-connected cars, appliances, cameras, roadways, pipe-lines and more -- in total about one trillion in use worldwide today. “Our focus should be on enhancing the quality of urbanization – from urban space, infrastructure, form and function, to lifestyle, energy choices and efficiency,” says Dr. Dhakal. Care is needed, he adds, to avoid unwelcome potential problems of dense urbaniza-tion, including congestion, pollution, crime, the rapid spread of infectious disease and other societal problems – the focus of social and health scientists who will fea-ture prominently at the conference. “We have a unique opportunity now to plan for a coming explosion of urbanization in order to decrease pressure on ecosystems, improve the livelihoods of billions of people and avoid the occurrence of major global environmental problems and disas-ters. That process cannot wait,” says Roberto Sánchez-Rodríguez, Professor Emeritus of Environmental Sciences at the University of California, Riverside. “It is also important to stress that differences exist in the urbanization process in high-, low- and middle-income countries and reflect them in our strategies. We need to move beyond traditional approaches to planning and be responsive to informal urban growth, to the value of ecosystem services, and to the need of multidimen-sional perspectives (social, economic, cultural, environmental, political, biophysical). • Better land-use zoning and building standards that increase efficiency and multiple uses. Professor Elinor Ostrom of Indiana University, the 2009 Nobel laureate in economics and opening day plenary speaker at the Planet Under Pressure conference, under-lines the importance of cities in giving effect to globally-developed policies to achieve environmental sustainability. Indeed, through initiatives such as C40, a consortium of cities committed to emis-sions reductions, cities are showing strong leadership. This approach can help ensure a move to a more sustainable pathway should global policies fail to deliver. Stir lots of small particles into water, and the resulting thick mixture appears highly viscous. When this dense suspension slips through a nozzle and forms a droplet, however, its behavior momentarily reveals a decidedly non-viscous side. University of Chicago physicists recorded this surprising behavior in laboratory experiments using high-speed photography, which can capture action taking place in one hundred-thousandths of a second or less. UChicago graduate student Marc Miskin and Heinrich Jaeger, the William J. Friedman and Alicia Townsend Friedman Professor in Physics, expected that the dense suspensions in their experiments would behave strictly like viscous liquids, which tend to flow less freely than non-viscous liquids. Viscosity certainly does matter as the particle-laden liquid begins to exit the nozzle, but not at the moment where the drop’s thinning neck breaks in two. In this image, lighted from the front, water containing zirconium dioxide particles measuring 850 microns in diameter detaches from a nozzle. The suspension neck maintains a symmetric profile until the neck gradually narrows to a width of only one particle, when the liquid surrounding the particles ruptures. New behavior appears to arise from feedback between the tendencies of the liquid and what the particles within the liquid can allow. “While the liquid deforms and becomes thinner and thinner at a certain spot, the particles also have to move with that liquid. They are trapped inside the liquid,” Jaeger explained. As deformation continues, the particles get in each other’s way. Miskin and Jaeger presented their results in the March 5 online early edition and the March 20 print edition of the Proceedings of the National Academy of Sciences. In their experiments, Miskin and Jaeger compared a variety of pure liquids to mixtures in which particles occupy more than half the volume. Few studies have examined droplet formation in dense suspensions. As Morris noted, such work could greatly impact applications such as inkjet printing, combustion of slurries involving coal in oil, and the drop-by-drop deposition of cells in DNA microarrays. In these applications particles often are so densely packed that their behavior defies a simple scientific description, one that might only take into account average particle size and the fraction of the liquid that the particles occupy, Morris explained. The UChicago study showed that particles cause deformations and often protrude through the liquid, rendering any such description incomplete until fundamental questions about the interface between a liquid mixture and its surroundings are properly addressed. “Miskin and Jaeger provide arguments for the importance of these protrusions in their work and suggest that the issue is of broader relevance to any flow where a particle-laden liquid has an interface with another fluid,” Morris said. Miskin and Jaeger verified their results by systematically evaluating different viscosities, particle sizes and suspending liquids, and developed a mathematical model to explain how the droplet necks evolve over time until they break apart. One initially counter-intuitive prediction of this model was that larger particles should produce behavior resembling that in pure water without any particles. “If you want to make it behave more like a pure non-viscous liquid, you want to make the particles large,” said Jaeger, who finds himself intrigued by nature’s seemingly endless store of surprises. Miskin and Jaeger indeed observed this when the particle size approached a significant fraction of the nozzle diameter, making the particles visible to the naked eye. “You think you have a pretty good idea of what should happen, and instead there’s a surprise at every corner. Honestly, finding surprises is what I love about this work,” Jaeger said. Scientists issued the first "State of the Planet" declaration at a major gathering of experts on global environmental and social issues in advance of the major UN Summit Rio+20 in June. The declaration opens: "Research now demonstrates that the continued functioning of the Earth system as it has supported the well-being of human civilization in recent centuries is at risk." It states that consensus is growing that we have driven the planet into a new epoch, the Anthropocene, where many planetary-scale processes are dominated by human activities. It concludes society must not delay taking urgent and large-scale action. "This is a declaration to our globally interconnected society," said Dr Lidia Brito, director of science policy, natural sciences, UNESCO, and conference co-chair. "Time is the natural resource in shortest supply. We need to change course in some fundamental way this decade," she added. Over 3,000 experts in climate change, environmental geo-engineering, international governance, the future of the oceans and biodiversity, global trade, development, poverty alleviation, food security and more discussed the intricate connections between all the different systems and cycles governing our ocean, air, land and the human and animal life dependent on those environments. Dr Mark Stafford Smith, Planet Under Pressure conference co-chair, said, "In the last decade we have become a highly interconnected society. We are beginning to realise this new state of humanity can be harnessed for rapid innovation." "But we need to provide more open access to knowledge, we need to move away from GDP as the only measure of progress, and we need a new way of working internationally that is fit for the 21st century," he added. "This conference has provided new ideas and practical solutions for the way forward." The declaration concludes that, "a highly interconnected global society has the potential to innovate rapidly. The Planet Under Pressure conference has taken advantage of this potential to explore new pathways." But, say Brito and Stafford Smith, effective planetary stewardship also requires: "More ways of participation at all levels, stronger leadership in all sectors of society; greater connectivity between those generating new knowledge and the rest of society; and rethinking the roles of science, policy, industry and civil society." Going beyond GDP by taking into account the value of natural capital when measuring progress. A new framework for developing a set of goals for global sustainability for all nations. Creating a UN Sustainable Development Council to integrate social, economic and environmental policy at the global level. Launching a new international research programme, Future Earth, that will focus on solutions. Initiating regular global sustainability analyses. The conference also previewed the first Inclusive Wealth Report, developed by UN University's International Human Dimensions Programme (UNU-IHDP) and the UN Environment Programme. Based on a new economic indicator that measures natural, human and produced capital, the tool goes beyond GDP and can provide guidance for economic development towards sustainability. Says Professor Anantha Duraiappah, Executive Director of UNU-IHDP: "Until the yardsticks which society uses to evaluate progress are changed to capture elements of long-term sustainability, the planet and its people will continue to suffer under the weight of short-term growth policies." The report, scheduled to be published at Rio+20, will describe the capital base of 20 nations: Australia, Brazil, Canada, Chile, China, Colombia, Ecuador, France, Germany, India, Japan, Kenya, Nigeria, Norway, the Russian Federation, Saudi Arabia, South Africa, USA, United Kingdom and Venezuela. Off the back of the declaration and recognizing the interconnectedness of the current challenges, the four major international research programmes under ICSU that direct global environmental change science (the International Geosphere-Biosphere Programme; DIVERSITAS; the International Human Dimensions Programme; and the World Climate Research Programme) aim to rapidly reorganize to focus on global sustainability solutions. Additionally, the programmes are proposing to develop platforms that facilitate cooperation with all sectors of society to develop a new strategy for creating and rapidly translating knowledge into action. "Such interactions should be designed to bring societal relevance and trust to science-policy interfaces, and more effectively inform decision-making to keep pace with rapid global change," reads the declaration. This strategy will form part of "a new contract between science and society" and includes the launch of a new international research programme, Future Earth. The Planet Under Pressure conference marked the beginning of this new shift in direction, according to the conference co-chairs. Delegates in London were joined by almost 8,000 people online worldwide and reached more than a million people through social media in the first three conference days. Dr Brito said, "We have a positive message: strong leadership from all sectors and harnessing the increased connectivity offers some hope that the risk of long-term environmental crises can be minimized." "This new connectivity is the beginning of how the scientific community needs to operate. We need a powerful network of innovation, North and South. This approach needs to be part of our DNA from now on," she added. In recorded remarks, UN Secretary General Ban Ki Moon said today that "climate change, the financial crisis and food, water and energy insecurity threaten human wellbeing and civilization as we know it." "My High-level Panel on Global Sustainability has just recommended that I consider naming a chief scientific advisor or establishing a scientific board to advise me and other organs of the United Nations. "I also intend to engage the scientific community on other projects, such as the Global Sustainable Development Outlook report," he added, "I am also ready to work with the scientific community on the launch of a large-scale scientific initiative." UN Rio+20 Executive coordinator, Elizabeth Thompson, said, "politician or public servant, scientist or citizen, community or company, we are the shareholders of Earth Incorporated and have a joint responsibility to protect our common patrimony." "The scientific community can help us make sense of these complex and interconnected challenges." Conference delegates also heard how research advances in the previous decade have shown humanity's impact on Earth's life support system has become comparable to planetary scale geological processes such as ice ages. "Consensus is growing we have driven the planet into a new epoch, the Anthropocene, in which many Earth system processes are now dominated by human activities," the declaration states. This new force risks pushing parts of the Earth system – the sum of our planet's interacting physical, chemical, and biological processes including life and society – past so-called tipping points. Tipping points include the disappearance of summer sea ice in the Arctic, permafrost in Arctic regions releasing large quantities of greenhouse gases into the atmosphere, and the drying out of the Amazon rainforest. If these tipping points are crossed they can increase the likelihood of going beyond other thresholds generating unacceptable and often irreversible environmental change on global and regional scales with serious consequences for human and all forms of life on the planet. The declaration stated that existing international arrangements are failing to deal with long-term development challenges such as climate change and biodiversity loss in an interconnected way indicating that it would be a mistake to rely on single international agreements. Research indicated that comprehensive sustainability policies at local, sub-national, national, and regional levels should be encouraged to provide "essential safety nets should singular global policies fail." The video makes it easy to visualize the geographical distribution and trends in post industrial revolution anthropogenic carbon dioxide emissions over 256 years. * The State of the Planet Declaration is by the Co-Chairs of the Planet Under Pressure conference, Dr Lidia Brito and Dr Mark Stafford Smith, supported by the conference Scientific Organizing Committee. The research discussed in the press releases, the conclusions drawn and the opinions offered are those of individual speakers or research teams at the Planet Under Pressure conference. The United States is now in a better position than at any time in the past to maintain a safe and effective nuclear weapons stockpile without testing and to monitor clandestine nuclear testing abroad, says a new report from the National Research Council. The report, requested by the Office of the Vice President and the White House Office of Science and Technology Policy, reviews and updates a 2002 study that examined the technical concerns raised about the Comprehensive Nuclear Test Ban Treaty (CTBT). The report does not take a position on whether the U.S. should ratify the treaty. A paper in the March 29 issue of Nature describes this foot, which is similar in some ways to the remains of another hominin fossil, calledArdipithecus ramidus, but which has different features. “What is clear is that the foot of the Burtele hominin was able to grasp items much better than its contemporary, A. afarensis, would have been able to do, which suggests that it was adept at moving around in trees,” says Levin, who was part of the team led by Yohannes Haile-Selassie of the Cleveland Museum of Natural History and included researchers fromCase Western Reserve University and the Berkeley Geochronology Center as well. Paul M. Gignac, Ph.D., Instructor of Research, Department of Anatomical Sciences, Stony Brook University School of Medicine, and colleagues at Florida State University and in California and Australia, found in a study of all 23 living crocodilian species that crocodiles can kill with the strongest bite force measured for any living animal. The study also revealed that the bite forces of the largest extinct crocodilians exceeded 23,000 pounds, a force two-times greater than the mighty Tyrannosaurus rex. Their data, reported online in PLoS One, contributes to the understanding of performance in animals from the past and provides unprecedented insight into how evolution has shaped that performance. Dr. Paul M. Gignac works with a 12-foot American alligator. In “Insights into the Ecology and Evolutionary Success of Crocodilians Revealed through Bite-Force and Tooth-Pressure Experimentation,” the researchers detail their examination of the bite force and tooth pressure of every species of alligator, crocodile, caiman, and gharial. Led by Project Director Gregory Erickson, Ph.D., Professor of Biological Science at Florida State University, the study took more than a decade to complete and required a diverse team of croc handlers and scientists. “Crocodiles and alligators are the largest, most successful reptile hunters alive today, and our research illustrates one of the key ways they have maintained that crown,” says Dr. Gignac. The team roped 83 adult alligators and crocodiles and placed a force meter between their back teeth and recorded the bite force. They found that gators and crocs have pound-for-pound comparable maximal bite forces, despite different snouts and teeth. Contrary to previous evolutionary thinking, they determined that bite force was correlated with body size but showed surprisingly little correlation with tooth form, diet, jaw shape, or jaw strength. Dr. Gignac emphasizes that the study results suggest that once crocodilians evolved their remarkable capacity for force-generation, further adaptive modifications involved changes in body size and the dentition to modify forces and pressures for different diets. The findings are unique, to the point that the team has been contacted by editors of the “Guinness Book of World Records” inquiring about the data. Among living crocodilians, the bite-force champion is a 17-foot saltwater croc, with a force measured at 3,700 pounds. The research was funded by the National Geographic Society and the Florida State University College of Arts and Sciences. The Department of Anatomical Sciences is one of 25 departments within the Stony Brook University School of Medicine. The department includes graduate and doctoral programs in Anatomical Sciences. The faculty consists of prominent and internationally recognized researchers in the fields of Anthropology, Vertebrate Paleontology and Systematics, and Functional Morphology.